The penultimate Grand Prix of 2018 came to a close, as Great Britain claimed its second gold of the tournament, whilst Spain claimed its first on yet another exhilarating day of action in Manchester. 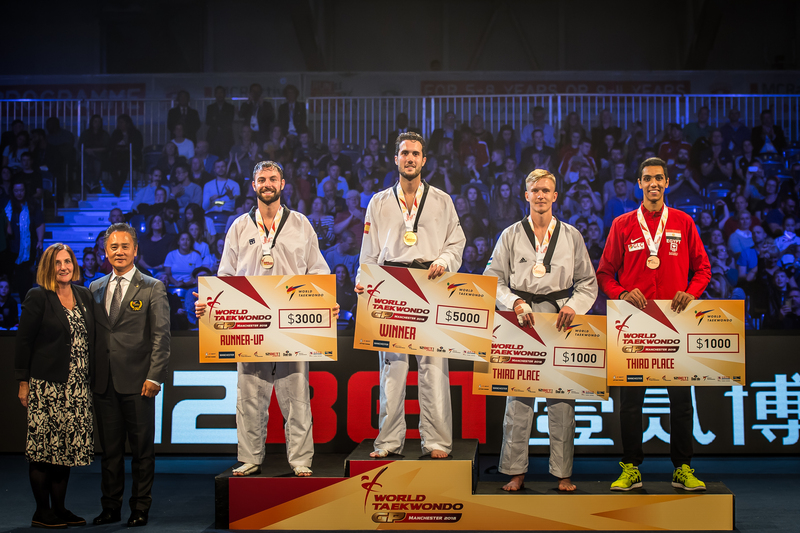 The penultimate final of the Grand Prix featured home-grown hero, Damon Sansum of Great Britain and Raul Martinez Garcia of Spain. Martinez Garcia started strongly with a kick to the head after just 10 seconds. He then followed that up soon after with a kick to the trunk to put himself 5-0 up. Sansum valiantly fought back by landing two punches to the trunk, only for Martinez Garcia to regain his five point lead with a front kick to the trunk. Round two began cagily, as Martinez Garcia defended well; Sansum just couldn’t break his impressive resistance. Martinez Garcia went on to land two punches, followed by two kicks to the trunk to take an 11 point lead into the last round. The animated crowd tried their best to cheer Sansum back into the fight, but Martinez Garcia remained composed. Martinez Garcia forced Sansum into conceding two gam-jeons in the third round, before landing a skilful kick to the head to put the fight almost out of reach. A frantic last 10 seconds saw both fighters score points, but the result was never in doubt. Martinez Garcia beat Sansum 22-7 to claim his first ever Grand Prix title. Double Olympic champion and crowd favourite, Jade Jones of Great Britain and Lijun Zhou of China fought in the last final of the Grand Prix. 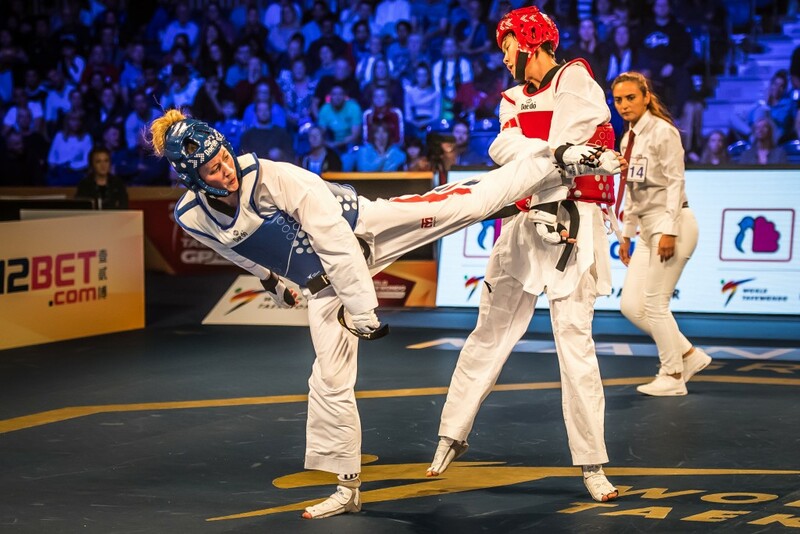 Jones came out of the blocks flying as she immediately landed a kick to the head, but when doing so she fell to the ground, meaning that she also conceded a gam-jeon. Jones used the energy of the crowd in the final stages of the first round as she successfully landed a punch and kick to the trunk. After round one, Jones found herself 7-1 up. Jones began the second round just as confidently by landing another kick to the trunk. Zhou tried her best to fight her way back into the match, but Jones was too strong defensively. Zhou would go on to land a punch to the trunk, meaning that the round finished 9-2. Both fighters began the third round with intent, but no points were scored until Jones landed a kick to the trunk after 30 seconds. With one minute to go, Jones was 11-2 up. Zhou went on to claim two points by landing consecutive punches to the trunk, but in the end it was not enough. Much to the delight of the energetic home crowd, Jones claimed her seventh Grand Prix title with an emphatic 11-4 victory.